For larger cake production facilities looking to automate production we offer various levels of production line to suit smaller industrial applications as well as larger dedicated set ups. The Reach Food Systems Bespoke Production Lines draw on the standalone component machines from the Reach Food Systems range and combine to deliver versatile systems designed and built specifically for each application. Commonly based around 2.5 metre indexed conveyor on a stainless steel chassis, accurate pneumatic depositors can be bridge mounted in a series or parallel over the conveyor. The depositors are fed continuously using transfer pumps which ensures uninteruppted productivity. The lines are ideal for a wide range of uses across Bakery, Confectionery and Food Service industries and by adding spraying, decorating or extruding heads to the system the lines present extremely versatile solutions to meet almost every production need. The units are modular, allowing for extra conveyors to be linked in to meet production expansion whether for throughput or variety of product. Similarly the Reach Food Systems Decorating systems are available as either single station units or bespoke production lines, offer icing and filling solutions. Single station units can combine pneumatic depositors with 360 degree turntables which are fully indexed and allow for users to top and bottom border, top and side ice, fill layers and decorate with rosettes for instance. Increased production can be achieved with to create bespoke conveyor based decorating units that combine depositors as well as sprinkling units over a conveyor. These systems are built for a process and product and can offer versatility and decoration solutions of all kinds. For larger sites and applications the Gorreri lines offer innovation and high quality solutions. All production systems from the range are for high volume automated production and solutions cover cupcakes, muffins, decorated cakes, bar cakes, swiss rolls and other bespoke products. 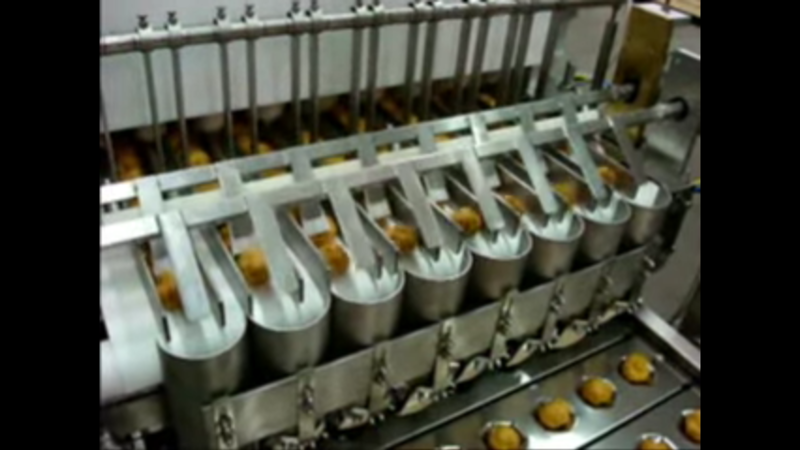 The Gorreri products have been developed over almost 30 years and recent UK installations include a fully automated eclair topping line that runs at over 6000 pieces per hour.